The growing interest in geothermal energy, its importance in future energy supply, and the need to accelerate its development make it very compelling to host a comprehensive industry forum which promotes and advances broader collaboration and innovation amongst geothermal’s stakeholders. To meet this objective, INAGA’s Annual Scientific Meeting will host The 6th Indonesia International Geothermal Convention and Exhibition (IIGCE) 2018, to be held from 5 – 8 September 2018 at Jakarta Convention Center. With this year’s theme “Empowering Geothermal for Indonesia’s Energy Sustainability”. We proudly encourage you to be part of the region’s premier event in Geothermal industry and benefit from its advanced programs. Theme: Geothermal Landscape & Objects, Human Interest & Natural Resources on/around Geothermal Sites and Geothermal Exploration & Production process. Drone Photography: Winner (1 person) & Runner Up (3 persons). Non Drone Photography: Winner (1 person) & Runner Up (3 persons). Prizes: Winner will get Rp. 7,500,000 and Runner Up will get Rp.2,500,000 each. Total prize is Rp. 30,000,000. Photographs must be in digital format. No print or film submissions will be accepted for entry into this competition. All digital files must be 1 MB or bigger, must be in JPEG or JPG format, and must be at least 300dpi. Photographs should be a minimum of 3,000 pixels wide (horizontally) in landscape format. Photographs must have been taken maximum 2 (one) years before the date of entry and may nor have previously won any award in any other competition. Only minor burning, dodging and/or color correction is acceptable, as is cropping. High dynamic range images (HDR) and stitched panoramas are NOT acceptable. Please do not include a border and marking. Images may be digitally enhanced to remove spots or scratches, but not manipulated. Participants can enhance the picture to make it brighter, clearer, etc, but not manipulate the content. The judges reserve the right to exclude any image they believe may have been excessively treated so as to alter its authenticity. The photograph, in its entirety, must be a single work of original material taken by the competition participant. By entering the competition, each participant represents, acknowledges, and warrants that the submitted photograph is an original work created solely by the participant, that the photograph does not infringe on any copyright, trademark, moral right, right of privacy/ publicity or intellectual property right of any person or entity, and that no other party has any right, title, claim, or interest in the photograph. Each participant may submit up to 5 (five) photographs for each category. Each photograph must have the Filename as follow: CategoryNumber-PhotoTitle-Location-PhotograperName-HandphoneNumber.jpg. Submission Deadline: August 17th, 2018. Winning and Nominated photographs will be displayed during IIGCE event from September 6th - 8th, 2018 at Jakarta Convention Center and First Winner get Field Trip Ticket. All nominated photographs are displayed, will get certificate of participation. 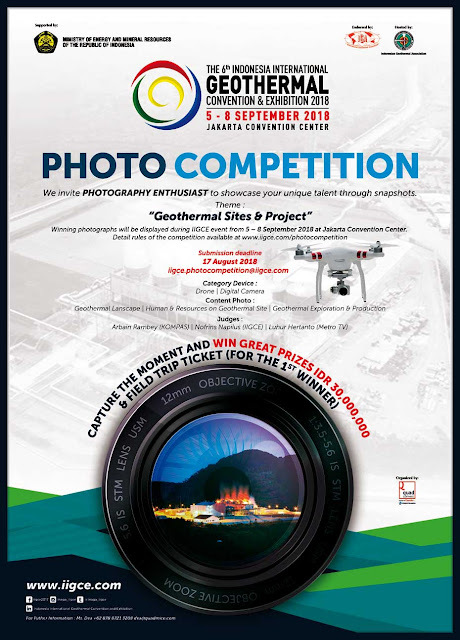 All photographs of the winner and runner up are available to be used for Geothermal publication and promotion. All photographs of the winner and runner up will be nominated to the Annual IGA (International Geothermal Association) Photo Contest.